When I go with my husband to home improvement stores, I like to browse around the different sections of the store while waiting for him. My favorites are the kitchen and bathroom sections where I can see different styles of lighting, tiles countertops, cabinets, small appliances, showers and faucets. 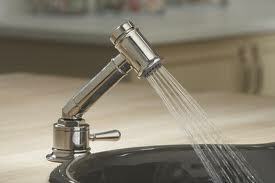 I particularly admire Kohler faucets for their innovative and unique styles and design. I am fascinated by the touchless faucets and the touchless toilet flushometers. They're not only creative but functional as well.